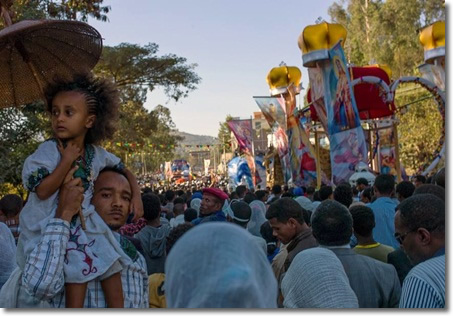 Timket is the greatest festival of orthodox Christians in Ethiopia. Falling on the 19 of January (or the 20 of January once in every four years), it celebrates the baptism of Christ in the river Jordan by John the Baptist. It’s a three-day affair and all the ceremonies are conducted with great pomp. The eve of Timket (18 January) is called Ketera. On this day the tabots of each church are carried out in procession to a place near a river where the next day’s celebration will take place. A special tent is set up for each tabot, each hosting a proud manner depicting the church’s saint. The ceremony is accompanied by hymns and dances of the priests, drum beating, bell ringing and blowing of trumpets. A tabot is a replica of the Arc of the Covenant and the ten tablets of the law which Moses received on Mount Sinai. It is the tabot rather than the church building, which is consecrated, and it is accorded extreme relevance.The priests pray throughout the night and mass is performed around 2 AM. Processional crosses of varying size and elaboration as well as various Ethiopian artifacts can be seen on the occasion. When the tabot is carried out, it is wrapped in brocade or velvet and carried on the head of a priest with colorful ceremonial umbrellas to shade it. The next morning around dawn ecclesiastics and believers go to the water and attend the praying. A senior priest dips a golden processional cross in the water to bless it and extinguishes a consecrated candle in it. Then he sprinkles the water on the people in commemoration of Christ’s baptism. Many believers leap fully dressed into the water to renew their vows. TimketKrestos – baptism of Christ – is merely a commemoration, not an annual rebaptism. After the baptism the tabots of each church, except St. Michael’s church, start their way back to their respective churches. The elders walk solemnly, accompanied by singing, leaping of priests and young men and beating of prayer sticks in an ancient ritual.